Ok….one more post before bed because I was sooooo excited to receive this package from the fabulous folks at PopChips today!!! 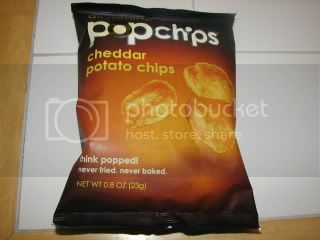 I LOVE PopChips if you all haven’t noticed ~ they are truly addicting in every way. 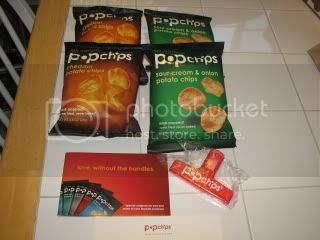 The PopChips peeps were nice enough to send me not, one or two, but, FOUR sample packs of their new flavors that came out in May. 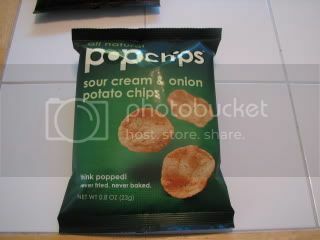 Sour Cream & Onion ~ good thing Mom & Sis left B4 I opened the pack b/c this is there fav flavor! Cheddar Potato ~ Yum! This is my 2nd fav flavor next to BBQ! The Husband was so cute! When he heard me say PopChips, he was like – oooohhh, any BBQ??? LOL…..Nope, but, this package was AMAZING! They included some great coupons so I can share some Pop LOVE and get The Husband some more BBQ chips and have them not add to his “love handles”! For all those wondering, No I haven’t gone chip crazy ~ it’s all in moderation and besides – everyone should have a little crunch in their life. 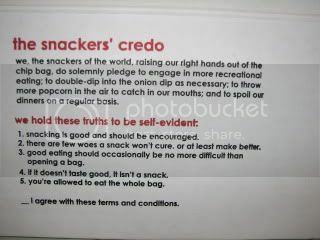 I LOVE their Snackers Credo and couldn’t agree more! Thanks again all the PopChippper People for hooking me up with one of my absolute FAVORITE crunchy, salty and HEALTHY snacks! I cannot wait to “Pop” some more. Reviews and more reviews to come soon! « I helped carry 800 lbs today! Thanks for sharing I also like pop chips and yes I hope soon I will taste the above one. I received the same package, and yet, all 4 of my bags are GONE. Chips don't last long in my house. Thats why I try not o buy chips!!! I LOVED both flavors. 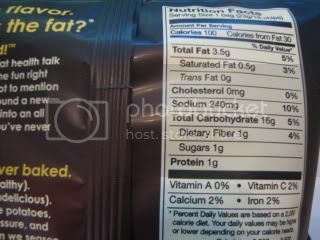 I love the nutritionals but I'm not crazy about the ingredients. great review! I'm not a big fan of chips but those look like they would be perfect for my family! Love the brick wall, by the way! I've been seeing these around the blog world lately but haven't tried them. Wonder if I could get my brother to eat them?! Peanut Butter Swirl ~ It IS good – especially if you are a sour cream fan – they pop alot of flavor! Best Supplements ~ I agree – Pop Chips Rock! I can't wait to hear what you think of the new flavors. 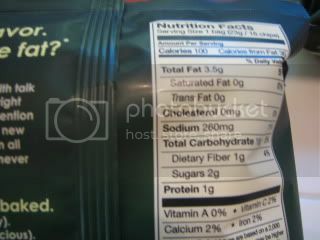 Sarah ~ That is how we are especially with the BBQ pop chips – LOVE them all! K ~ You have to try the cheddar – I think it's better than the sour cream and onion which is still amazing. April ~ I like these because they are a healthier alternative and they taste better than the real deal. C.G ~ They ARE fabulous! Anne ~ They totally taste like sour cream and onion pringles – I think you'd love them! They are fun to eat. Angelea ~ Thanks – the brick wall is going to look so awesome. Emily ~ You wouldn't eat them with your brother? Or to make the trade from the fattier version. I bet you could, The Husband prefers these over fatty chips. If we have both types in our house, the Pop Chips are the first ones he picks.